The EUR/USD is climbing on tepid volume despite light EU econ data as we enter another holiday-shortened week. Regardless, the EUR/USD is recording solid gains today and we notice a sizable pop in the AUD/USD as well. However, the Cable is declining, resulting in a strong upward movement in the EUR/GBP. It’s unclear exactly what is giving the Euro its relative strength over the Pound, yet topside participation in the AUD/USD indicates investors may be reacting to a negative development in the UK. That being said, investors will receive some key HPI and CB Consumer Confidence data from the U.S. Should U.S. data continue last week’s weak performance, then the EUR/USD may log further gains as the Dollar’s rally unwinds. Meanwhile, the EU will release Germany’s Prelim CPI today followed by tomorrow’s M3 Money Supply. However, reaction to these data points may be limited as investors enjoy the holidays. Technically speaking, the EUR/USD faces multiple downtrend lines along with the psychological 1.45 level and 12/16 highs. Hence, some challenging near-term topside technicals are in place due to the EUR/USD recent deterioration. As for the downside, the EUR/USD has technical cushions in the form of our two uptrend lines along with intraday and 12/22 lows. The Cable is trading back below its psychological 1.60 level today despite pops in both the EUR/USD and AUD/USD. It’s difficult to determine exactly what’s driving the Pound lower today, as exhibited by a strong upward movement in the EUR/GBP. There’s limited news and data flows around Western economies as the markets enter another holiday shortened week. Furthermore, there’s limited data from the UK until Thursday’s Nationwide HPI release. Hence, the Pound’s relative weakness today may be carrying over from last week’s cautious BoE Meeting Minutes which indicated that the central bank is not likely to take any monetary action until February’s meeting as governors assess the impact of recent QE measures. Meanwhile, the U.S. will light up the data wire today with the release of CB Consumer Confidence and HPI figures. More mixed data from the U.S. could weaken the Dollar further as investors lock-in profits derived from investor confidence in the U.S. economy, a positive catalyst for the Cable. On the other hand, strong U.S. econ data should keep the Cable subdued around 1.60 and previous December lows. Technically speaking, the Cable’s large pullback this month has sent the currency pair below some key technical levels. Hence, it’s possible the Cable could be entering a more protracted downturn. However, we’ll have to see whether the Dollar’s present weakness can accumulate and send the Cable back above some downtrend lines. If not, the Cable does have some technical supports in the form of September and October lows. As for the topside, the Cable faces multiple downtrend lines along with 12/18 and 12/16 highs. The USD/JPY is consolidating with an upward bias despite pops in both the EUR/USD and GBP/USD. Hence, the USD/JPY seems to be trading on its own fundamentals rather than its correlation with the Dollar. That being said, the USD/JPY is likely deriving its strength from last week’s statement from the BoJ implying that the central bank plans on maintaining its loose monetary policy for the foreseeable future, or at least until there is a considerable recovery in prices. Hence, last week’s -1.9% Tokyo Core CPI reading indicates investors likely won’t see tightening from the BoJ for quite some time. Meanwhile, investors are expected the Fed to begin reigning in its alternative liquidity measures next year, giving the Dollar a relative strength over the Yen for the time being. However, mixed U.S. econ data last week is holding back the USD/JPY’s rally as investors lose a bit of confidence in the U.S. recovery and take this as an opportunity to lock-in recent Dollar gains. As a result, the USD/JPY is deadlining until we receive some more U.S. econ data. The U.S. will release some HPI and CBI Consumer Confidence today, which would normally be market movers. However, activity around the FX market is subdued right now since we’re in another holiday-shortened week. Technically speaking, the USD/JPY is encountering some key downtrend lines. 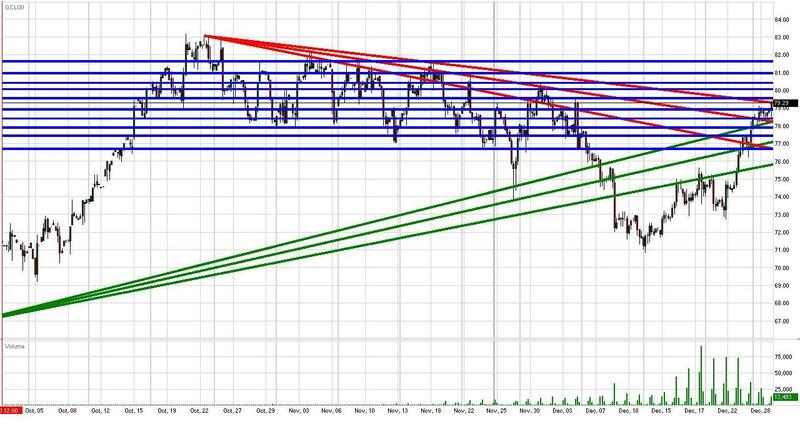 Our 2nd and 3rd tier downtrend lines run through April and August highs, respectively. Hence, should the USD/JPY clear these two downtrend lines, we could see the USD/JPY extend its present uptrend towards the highly psychological 100 level again over the medium-term. Meanwhile, the USD/JPY faces addition topside technical barriers in the form of October and September highs. As for the downside, the USD/JPY has multiple uptrend lines serving as technical cushions along with 12/24 and 12/21 lows. Furthermore, the highly psychological 90 level could serve as a strong support area should it be tested. Gold has popped back above the highly psychological $1100/oz level, which could turn out to be a hard fought battle since the area does carry some extra psychological weight. Gold is finding its strength in Dollar weakness as we witness pops and consolidation in the EUR/USD and AUD/USD. However, weakness in the Cable and strength in the USD/JPY is likely tempering gains in gold along with the gravitation force of $1100/oz. Meanwhile, activity should remain at a subdued level since we’re in another holiday-shortened week. The U.S. will release some key economic data this week, beginning with today’s CB Consumer Confidence and S&P HPI figures. More mixed U.S. data could yield additional Dollar weakness as investors lock-in recent Greenback gains, a positive catalyst for gold due to their negative correlation. That being said, markets could move a bit should upcoming data surprise in either direction. Technically speaking, gold has multiple uptrend lines serving as technical cushions along with 12/18 and 12/23 lows. As for the topside, gold faces technical barriers in the form of 12/21,12/15, and 12/7 highs along with the psychological $1150/oz level. Crude futures are popping towards $80/bbl as crude continues last week’s positive momentum stemming from reduced inventories, lower U.S. employment, higher consumption, and inaction from OPEC. Additionally, the EUR/USD and AUD/USD are popping today, a positive catalyst for Dollar-denominated commodities. Meanwhile, the S&P futures are setting new 2009 highs as the year comes to a close, also a positive catalyst for crude. Furthermore, political tensions in Iran couple with a cold front in the U.S. are having a positive psychological impact on crude. Overall, crude’s fundamentals, correlations, and psychologicals are working in its favor, allowing the futures to move beyond $75/bbl with relative ease. However, activity could remain at a subdued level today due to another holiday shortened week. Therefore, crude futures may not get the boost they need to break through the psychological $80-$82/bbl area which posed problems for crude during November. Meanwhile, the U.S. will release CB Consumer Confidence soon and it will be interesting to see how crude and the Dollar react. Technically speaking, crude futures have multiple uptrend lines serving as technical cushions along with 12/18 and 12/22 lows. Additionally, the psychological $75/bbl level could serve as a technical cushion should it be tested. As for the topside, crude futures are currently testing our key 3rd tier downtrend line. Our 3rd tier runs through November highs, meaning an eclipse of this downtrend line could indicate a retest of 2009 highs. Meanwhile, the psychological $80/bbl area could serve as a solid technical barrier. The S&P futures are marching higher despite last week’s mixed economic data. Home sales and durable goods orders both revealed a mixed bag recovery, yet another decline in weekly unemployment claims was certainly welcome. In all, U.S. equities and the Dollar are still locked into their uptrends despite present weakness in the Dollar. Weakness in the Greenback stems from a combination of overbought conditions and mixed econ data. However, it seems there will have to be a considerable pullback in U.S. economic data for the S&P’s uptrend to reverse. The light news and data wires should result in tepid market activity as investors enjoy another holiday-shortened week. Meanwhile, investors should monitor movements in the Dollar since it has been positively correlated with U.S. equities lately. Any further noteworthy pullbacks in the EUR/USD and/or GBP/USD could prove to be a positive catalyst for U.S. equities, and vice versa. Markets will digest the release of CB Consumer Confidence data followed by Chicago PMI tomorrow. However, as we mentioned, reaction to this week’s economic data may be limited due to light volume. Technically speaking, the S&P futures are still locked into their medium-term uptrend after setting consecutive higher lows while breaking out of previous 2009 highs. Furthermore, the futures have the highly psychological 1100 level serving as a technical cushion along with multiple uptrend lines should condition deteriorate. As for the topside, the S&P’s only foreseeable near-term technical barrier is previous 2009 highs. Disclaimer: FastBrokers' market commentary is provided for information purposes only and under no circumstances should be regarded neither as investment advice or as a solicitation or an offer to sell/buy any financial product. FastBrokers assumes no responsibility or liability from gains or losses incurred by the information herein contained. All materials are property of Fast Trading services, LLC and unless otherwise indicated, any unauthorized reproduction is prohibited. Risk Disclosure: There is a substantial risk of loss in trading futures and foreign exchange. Please carefully review all risk disclosure documents before opening an account as these financial instruments are not appropriate for all investors.